Andy Serkis as ape leader, Caesar in "War for the Planet of the Apes." It seems appropriate that I heard news of director George Romero's passing while leaving a showing of "War for the Planet of the Apes." Romero was a master at using genre filmmaking as a lens through which to explore social issues like civil rights, consumerism, militarism, and xenophobia. The messages in Romero's films were rarely subtle, but they were always effective. Twentieth Century Fox's new series of "Planet of the Apes" films is one of the current popular franchises to carry on that legacy, weaving timely political subtext into a story that warns against human arrogance and fear. And the latest installment mostly does the visionary director proud, even if it does end up stumbling slightly while crossing the finish line. 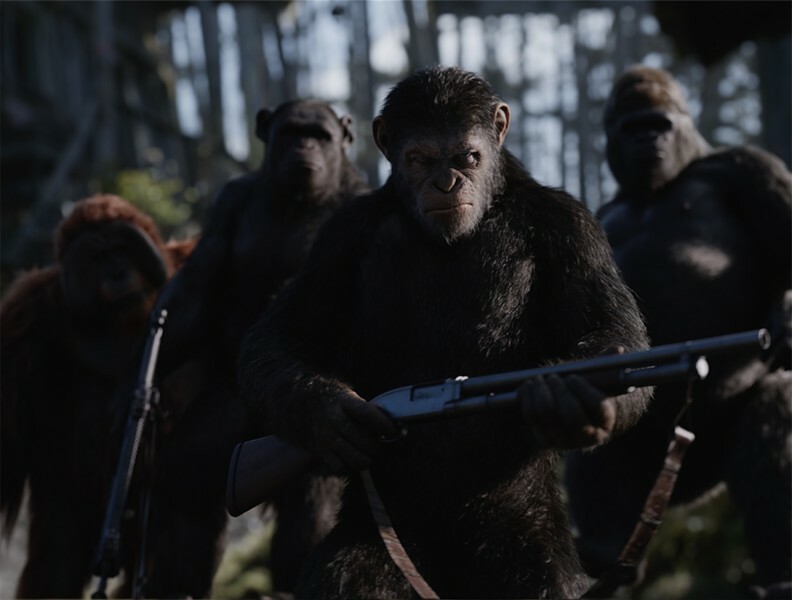 "War for the Planet of the Apes" is the final chapter in a trilogy of films centering around Caesar -- once again portrayed by Andy Serkis through endlessly impressive motion capture technology -- the reluctant leader of the ape rebellion. The previous two films detailed how that uprising took root after a "Simian Flu" virus wiped out large parts of the human population while bestowing apes with heightened intelligence. The film begins with the last vestiges of humanity still engaged in combat against the apes, though despite the "War" title, the film takes place mostly in the aftermath of that struggle. Following an excellent opening battle sequence, the rest of the narrative takes the form of a straightforward revenge tale, after an act of mercy from Caesar results in tragedy for his clan. The ape leader abandons his command to seek vengeance against The Colonel (Woody Harrelson channeling Brando's "Apocalypse Now" character), whom he believes responsible. Having long since established which side of the quarrel are the true savages, "War" manages to succeed in making its audience root against its own species, but does so by sacrificing some of the moral complexity of the previous films. Without villainous apes and decent humans to balance out the conflict, things are more black-and-white this time, and there's nothing as compelling as the previous installment's exploration into the inherent dangers of tribalism and cycles of violence. You can feel the mechanics of the film grinding along as director Matt Reeves (who also helmed the superior "Dawn of the Planet of the Apes") works to provide an emotionally satisfying conclusion to Caesar's story, while also delivering a serious reflection on our troubled times. Not for nothing does the plot boil down to a conflict brought on by a unstable, megalomaniacal leader obsessed with building an enormous, likely useless border wall. Taking place in the same universe as the earlier "Planet of the Apes" films, we know how this will all shake out and there's a sense of inevitability that robs the film of some of its dramatic stakes. The film is unrelentingly bleak, with the only source of levity provided by Steve Zahn as Bad Ape, his name taken from the most common phrase he heard from the humans at the zoo he once called home. What makes the film work, though, is the remarkable Andy Serkis, who continues to be a pioneer in acting with motion capture. The soulful Caesar is an incredible creation, a perfect melding of performance and technology. Romero's allegories tended to land like a punch to the gut, and while "War for the Planet of the Apes" doesn't strike as powerful a blow, it still finds a way to leave its own mark. Check back on Friday for additional film coverage, including a review of Christopher Nolan's "Dunkirk."